It’s hard to take a landscape painter out of the landscape! You might call this one a hybrid. 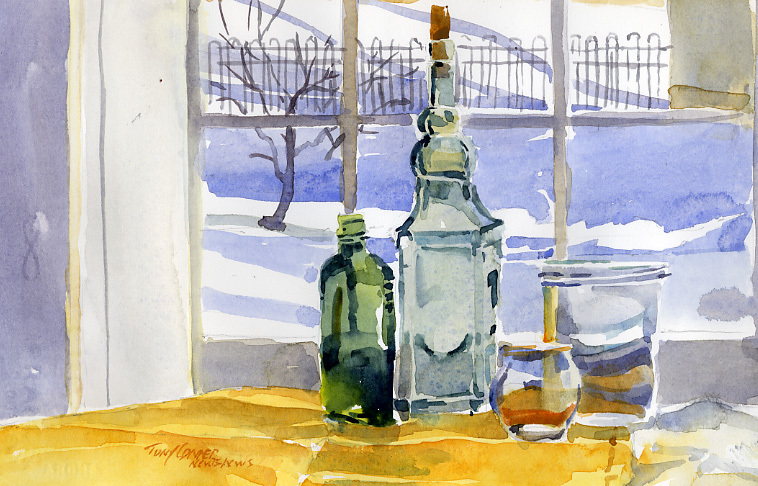 The background scene out the window – on a sunny day this time – from Monday’s post and the same objects from yesterdays. I like the contrast of indoor items against an outdoor scene. 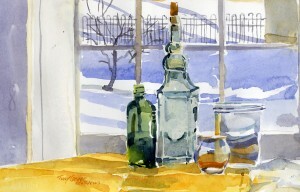 In this one, particularly, the warm golden yellow cloth is a bright statement against the blue shadows outside. In this painting, the glass objects are not the stars of the show, but only the supporting cast. Although they are visually attractive, the eye wants to look past them to the outdoor scene.